Other guilds beware, here comes Simic! The Simic Combine guild in Magic: The Gathering is always full of surprises, the latest being a new spoiler from the War of the Spark expansion. 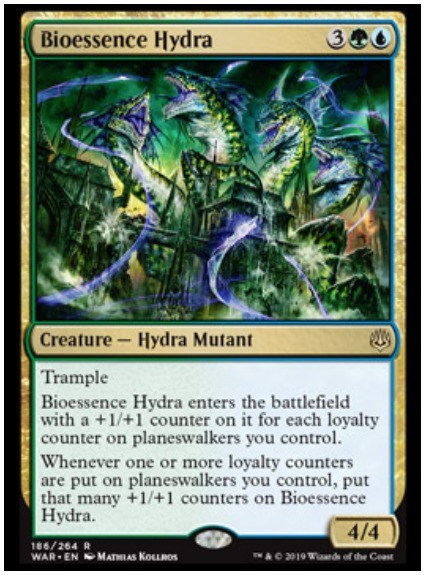 Featuring a host of planeswalkers and gods, Bioessense Hydra manages to hold its own by growing in power off planeswalker loyalty counters. The Bioessence Hydra is a five mana (one blue and one green) mutant creature with trample. It’s power and defense begin as a four/four, but are able to grow off a player’s planeswalkers loyalty counters. 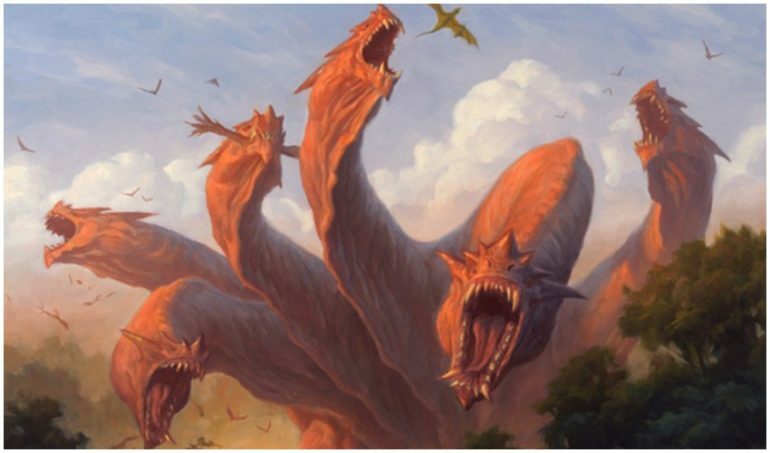 “Bioessence Hydra enters the battlefield with plus one/plus one counter on it for each loyalty counter on planeswalkers you control.” For five mana, a four/four creature with trample is a good card. Add in the effect of gaining counters for every planeswalker loyalty counters and Hydra becomes massively powerful. And it’s not just when Bioessence Hydra comes onto the battlefield. “Whenever one or more loyalty counters are put on planeswalkers you control, put that many +1/+1 counters on Bioessence Hydra. Hydra is a bomb in the limited draft and will fit nicely into a variety of Standard decks. Proliferate cards will not only boost planeswalker loyalty counters but Bioessence Hydra too. Elderspell will also boost it while taking out your opponent’s planeswalkers in the process. Bioessence will also work in combination with Llanowar Elves on turn one and Kiora, Behemoth Beckoner on turn two. Kiora’s minus one ability un-taps a land, allowing for Bioessence Hydra on turn three with power and defense of 11. MTG War of the Spark in coming to MTG Arena early on April 25. The physical cards in the expansion will drop on May 3.